Mmm not a lot to report today. When I decided to do 30 for 30, I knew I wanted to update as close to every day as possible so I could get all my outfits in, but I often don't have that much important stuff to say every day (that's actually a lie- Erick gets paragraph upon paragraph of Facebook messages twice, sometimes three times a day, but to be honest, I talk an awful lot of rubbish to him). Today has been uneventful. I've just stayed home and had another day of recovery and wrote some articles. Thankfully, I am much, much better today. My chest is still really sore but my whiplash has eased off a lot and my knees feel a lot better. Thanks again for all your lovely support. Last night was fun though. My friend Jenny called after hearing about my accident and asked if I wanted any company, so her and my friend Eve came over for an hour or so last night. We've been friends since we were 12 so we have lots of memories to reminisce about, and someone always brings something up we'd all forgotten about. Then after they'd left I skyped Erick for an hour which was lovely. Long distance relationships are tough, but I'm learning just to take one day at a time. Erick pointed out that I keep trying to talk about our relationship all the time, and I know that I can't do that, but sometimes I'm scared not to. Last night it was nice to have a chat, and then we had some fun with these questions, which I'd read about online. Long distance couples often run out of things to talk about because they don't share the same experiences as much, and talking is the only communication they have without the physical side, so a few websites I'd read recommended questions like this, which really get you talking again. We definitely have plenty of material!! So onto the outfit!! One of my own personal rules for 30 for 30 was not to repeat items too much in the first week or so. Whenever I look at Kendi's final list of outfits each time she takes the challenge, I always find you can barely tell there's only 30 items involved because all her outfits look so different, so right now I'm trying to avoid too-similar outfits early on. 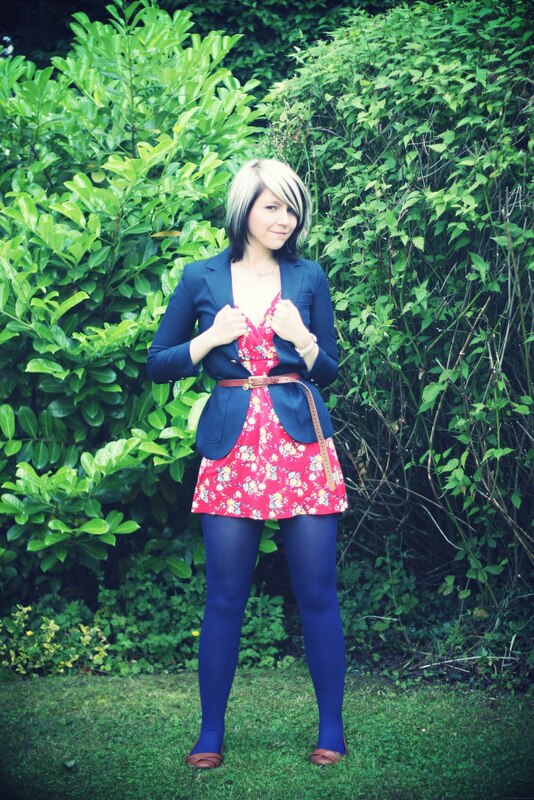 Because of my knee-problem though (have a look at the state of them in yesterday's post if you don't know what I'm talking about), it is difficult as I'd planned a lot of outfits with skin-coloured tights or bare legs. Today, however, I decided to embrace the situation and wear something other than my standard black opaques. Not a huge jump though, just to, well, navy opaques. This outfit was actually inspired by the queen of 30 for 30, Kendi herself. Well, I'm going back down to Birmingham tomorrow for a few days and then I have work Friday and Saturday so I'm not sure when my next outfit post will be. Gosh, I'm getting SO behind with 30 for 30. This should be day 9 and I'm only up to day 5!! Ahh I'll get there eventually!! Also, if you're a Facebook user (which I know you all are!!) 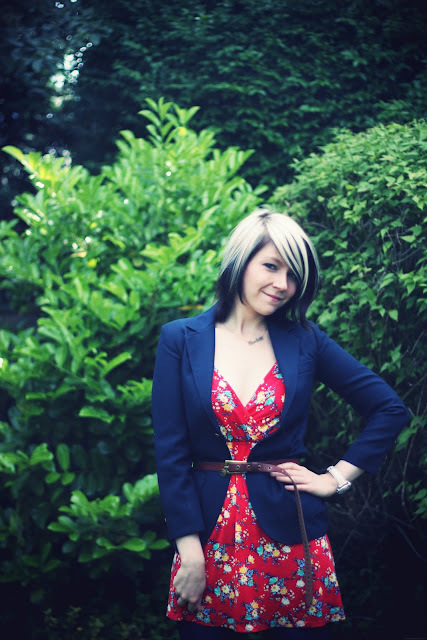 could you please vote for me in the Very Dream Fashion Job Competition? Go here and search Charlotte Crowley and vote!! Thanks!! I love the belted blazer look, it goes great with the red floral dress. You seriously look fantastic for someone who just survived a car crash, I would not have been out of bed yet. Thank goodness you are alright, hope you are feeling better soon! You look gorgeous! I think that dress was made for you & I love it with the blazer! I'm also so glad you're feeling better and that you go to skype with Erick. Since Danny & I only have one hour time difference, we pretty much skype everyday, which definitely makes me feel spoiled when I read about you and Erick! I'm so glad Skype was invented though - it makes me feel so much better to be able to see Danny when I talk to him! I'll be honest I got really excited by the title of this post... I thought I was going to see duck pictures! (You know how you love Panda's... well I LOVE ducks) but alas no ducks :( However you're outfit is really cute! 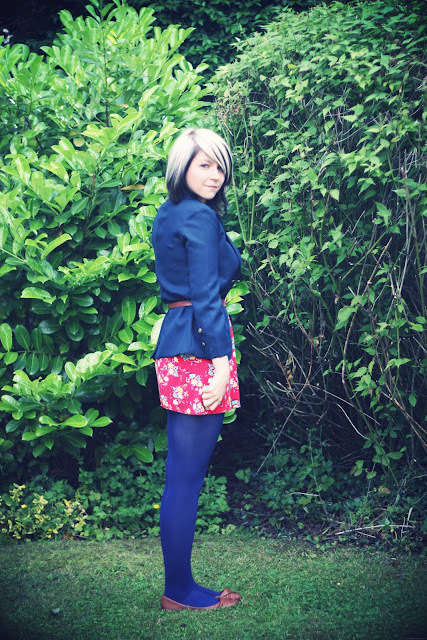 I actually feel like I need a pair of navy tights in my life right now! Glad you're feeling better :) And yes Long distance relationships are tough, but you just have to remember to keep talking! oh that last bit made me swoon a little, its just so cute!!!! and i love your blazer belted with the dress, i need to find a navy one like it!!! 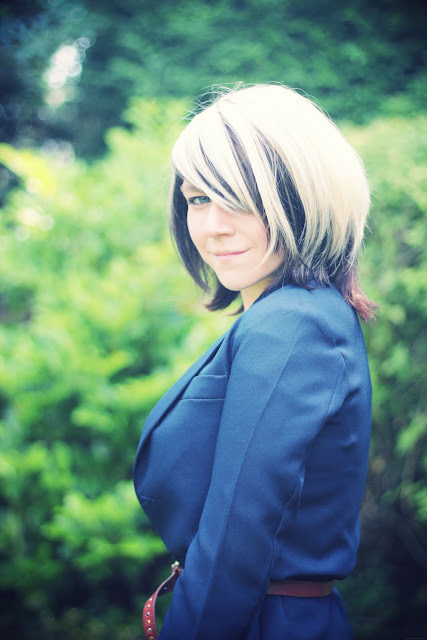 you are rocking this look--i love your take on it, especially with the belted blazer and all the navy. you look fabulous! 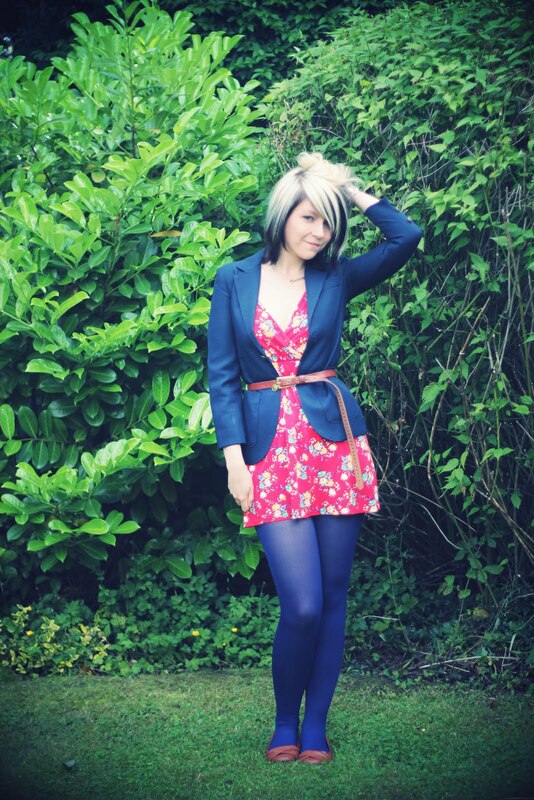 You look way beautiful in the dress/blazer combo! I'm glad you're feeling some better. I'd have been moping for days, but you've got straight back on it, I'm super impressed! You look gorgeous as every too. i do love how you're creatively using your tights this remix. :) also, the belted blazer? love it! 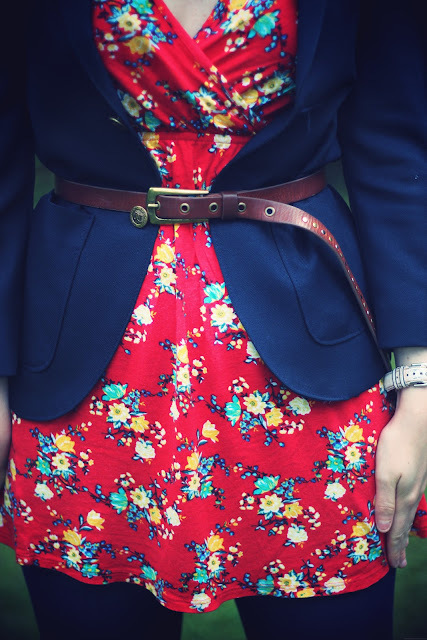 really cute - love the belted blazer! whiplash sounds so scary. I am sorry you are still in pain from it. I'm glad you have a caring friend there for you.